The club runs a variety of different rides and events. Here’s a brief guide. These rides last two hours, setting off from the Windrush pub in Witney at 7pm. In winter months lights are required. The rides head out of Witney, generally to the North, and are composed of a variety of offroad routes linked together by short on-road sections. The leaders will generally try to make sure that consecutive weeks take the club over different routes. These rides are suitable for anyone over the age of 13, regardless of skill level or fitness – the leaders will tailor the route for those present and make sure everyone has a good time. Faster riders are also welcome, and may be led ahead of newer or slower riders to keep the ride enjoyable for everyone (the club often has multiple leaders attending these rides). The aim of Thursday rides is fun! These are slightly tougher rides than the Thursday rides, and are aimed at people wishing to push themselves a little harder to improve both their skill level and physical fitness. They’re still open and welcoming to all comers, but you will need a higher level of fitness and should be prepared to encounter a greater level of technical challenge (though you’ll never be asked to ride anything you’re not comfortable with!). These run for a couple of hours on Tuesday nights from the Windrush pub, but don’t take place through the winter months. Due to the nature of these rides, riders must be at least 16 years old. Similar to the Thursday rides, but a slightly more relaxed in pace, these rides are also open to younger participants (ages 10 and up), and start from Standlake village hall at 6.30pm. These rides are open to all ages and all skill levels, with an emphasis on fun. These rides may either be in the local area or may be combined with a trails centre visit (see below). 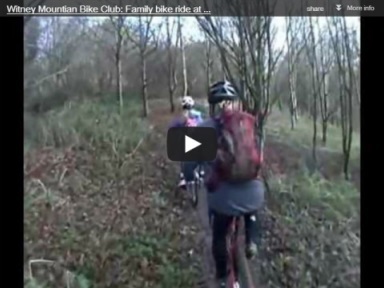 These are days out organised by the club to trails centres nearby, such as Bracknell, Cannock Chase and Afan Forest. They are often combined with Family Rides, in which case the club may split up at the site to provide everyone with an appropriate riding group. These are courses designed to develop basic bike skills in children and incorporate lessons, games to develop skills and rides for older children, mixing both road and offroad riding. Our Go-Ride sessions are always tailored on the day for the skill level of the participants. Similar to the Go-Ride sessions, but aimed at adults. These are aimed at older riders coming back to cycling, and aim to boost confidence and get you back on the road safely. The club also runs a variety of less regular events throughout the year – keep an eye on this site to stay informed!